EcoCruising Boat Tours and Charters has been a locally owned business for over 25 years. New owners, Chris & Mona Schran, are pleased to be continuing this valuable service for local residents and a wonderful way for tourists and locals alike to see our beautiful area by sea "up close and personal". Previous owner, Brian Smiley, with his strong background in aquatic research, environmental science, ocean stewardship will still be available for some special tours. We have several skippers available to try and suit everyone's time frame and wishes. Take advantage of the vessels all-weather comfort and our operators versatility. Whether you'd like a gourmet picnic and sunset cruises, informative group tour for seniors from lodges and centers, boat rides for group-home clients in wheelchairs; ecology expeditions for world-travelers, eagle viewing for longstay ‘snowbirds’; birthday parties for nine to 90 year olds or special cruises for anniversaries, wedding vows, reunions and memorials, we can do it all. Even Canada's Next Top Models were onboard for television's premier show, filmed as they were boated to their secret destination home in Saanich Inlet. We also offer water-taxi pickups and grocery shopping shuttles even in the rain, snow and dark, serving residents of several local private islands. Partially in recognition of these accomplishments, the Saanich Penisula Chamber of Commerce honored EcoCruising with the 2007 Runner-Up Award as the Best Successful Business for 1-25 Employees, and with the 2009 Runner-Up Award for Environmental Responsiveness. Our skippers are a special blend of ecologist, gracious host, fun story-teller and competent mariner. They are dedicated to providing an 'edu-taining' narration of interest to all ages and backgrounds. They have extensive local knowledge of Saanich Peninsula waters, knowing where and how to treat you to world-class scenery and rich marine life. Most importantly, the guides are fully certified to operate and navigate the vessels, and are committed as first priority to client safety and comfort. 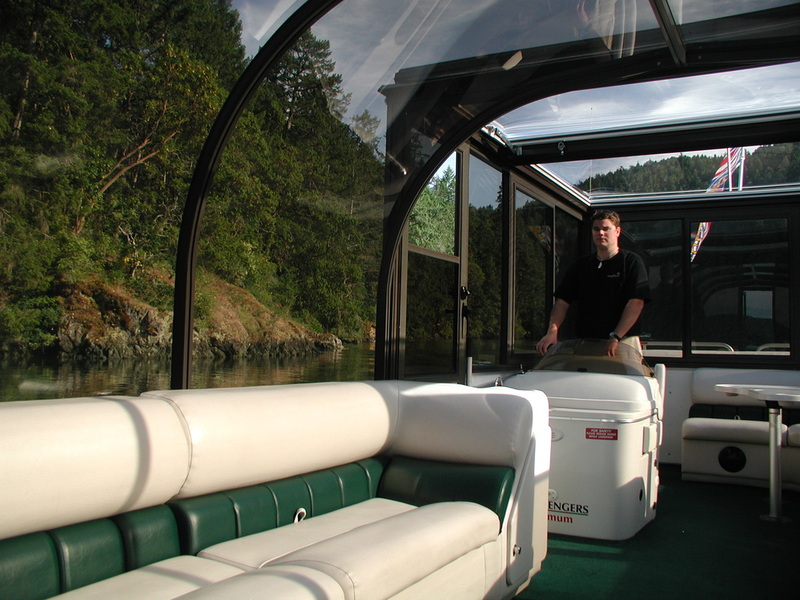 The company fleet is three commercial 28' pontoon vessels with custom-built solarium domes for all-weather comfort. The vessels are each certified to carry 12-passengers and their skipper-guide. They are reliably-powered by quiet, efficient 115 or 225 HP four-stroke outboard motors. The vessels are in annual compliance with the Canada Shipping Act and other regulations administrated by Transport Canada and the Canadian Coast Guard. When stepping onboard, most people are immediately impressed at the warm living-room atmosphere. Everyone relaxes on a soft sofa while surrounded by the spectacular panaroma view. The tour routes stay near the shorelines in protected waters, ensuring a smooth, stable ride. 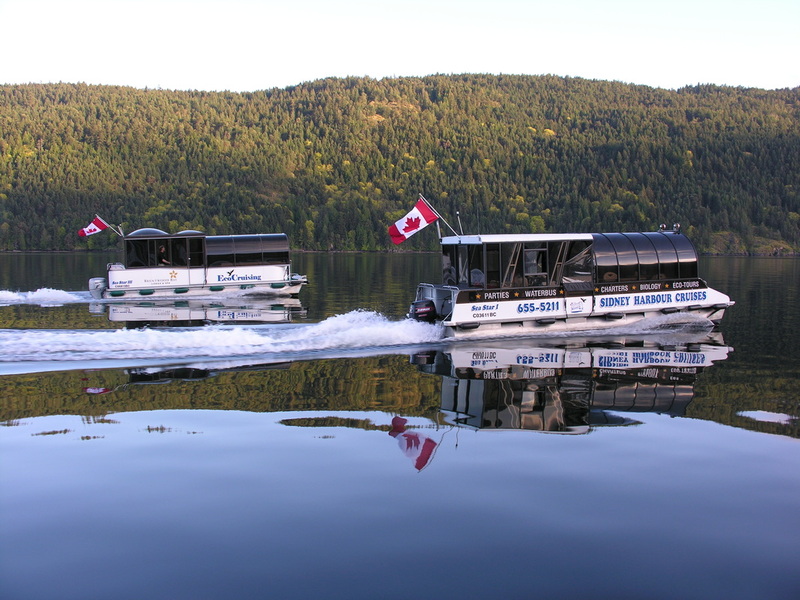 The vessels are fully wheelchair accessible; you simply roll aboard from a wide dock. The vessels' shallow draft allows close approach to the scenic coastline for excellent wildlife viewing, and even short stops at remote beaches for intertidal exploring. A convenient bow door enables guests to simply step out onto the sand or a dock!